Remember when winery tasting rooms were intimate, friendly and small enough to enjoy a glass of wine in a pleasant, non-hurried environment? Now you can step back in time at the Robert Craig Tasting Salon in Downtown Napa and enjoy the peaceful, park-like setting adjacent to the Napa River while sipping Robert Craig's sillky-smooth mountain Cabernets. We're just minutes away from the Oxbow Market, the Napa Valley Wine Train Depot and the Napa Town Center. 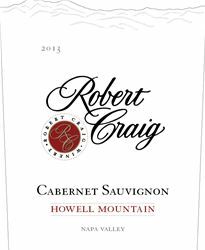 Call or email Jeff to schedule a tasting of Robert Craig mountain Cabernet Sauvignons and our other varietals. To join the wine club, visit www.robertcraigwine.com or call 707-252-2250. Members of the Cabernet Club receive four world-class Robert Craig Cabernet Sauvignons every year. This is a rare opportunity to sample Robert Craig's highly sought-after, hand-crafted wines and receive the special benefits of Cabernet Wine Club membership, including a 10-20% discount on all wine purchases based on membership, priority access to allocated wines, and invitations to "members only" events at our winery on Howell Mountain. For more information, go to: www.robertcraigwine.com or call 707-252-2250 x 2. Complimentary tasting. 10% discount on purchases. Robert Craig Winery is certified under the Napa Green Winery Program by the Napa County Department of Environmental Management (DEM) and the Association of Bay Area Government’s (ABAG) Green Business Program and completed all the regulatory components needed for environmental sustainability. These components included developing water and energy conservation methods, preventing pollution, and reducing solid waste. In addition to developing sustainable winery practices, this program is set to become the standard for the state of California. Robert Craig Winery is certified under the Napa Green Certified Land Program. Robert Craig Winery has created and implemented a customized farm plan with measured results that addressed all aspects of its property, vineyard land as well as non-farmed land, including practicing soil conservation, water conservation, stable drainage, riparian corridor enhancement, fisheries and wildlife habitat enhancement and long-term improvement and sustainability.